This sumptuous, 14-story apartment building was designed by Rosario Candela and is widely considered one of his greatest luxury apartment designs and one of the city's most prestigious addresses. His original design for developer Anthony Campagna, however, was for a narrower structure. "Of the six houses on the block front between 64th and 65th Street, Campagna had been able to acquire only the four central ones after two years of negotiation. As a result, the plans he originally filed were for a symmetrical, 120-foot-wide structure on the mid-block site of those houses. 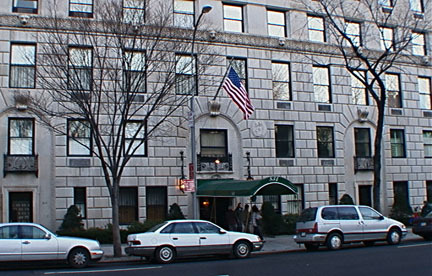 After construction work was well along using the first design , the holdout house of the 64th Street corner was acquired from owner Margaret V. Haggin. In April 1930, the plans were changed to accommodate the larger site and the building was asymmetrically extended southward. Mrs. Haggin was the second wife and widow of James Ben Ali Haggin, who had died in his 90s about 1915. She moved in to a duplex apartment in the new completed 834 Fifth Avenue, and remained there until her own death in 1965." Mr. Alpern's book reproduces the rendering for the original smaller builder as well as a photograph of the Haggin mansion on the corner with the steel work for Campagna's building rising above it just to the north. Mr. Alpern also noted that Laurance Rockefeller commissioned Harrison & Abramovitz in 1948 to design a triplex penthouse apartment in the building that he occupied for many years. 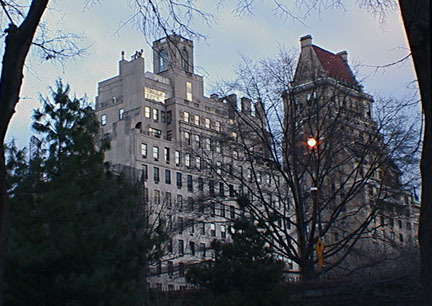 The building was completed in 1931 and is directly across from the entrance to the Central Park Zoo. 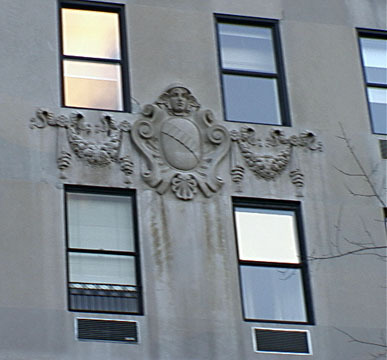 The limestone-clad façade is rusticated at its base and has some Art Deco-style cartouches. 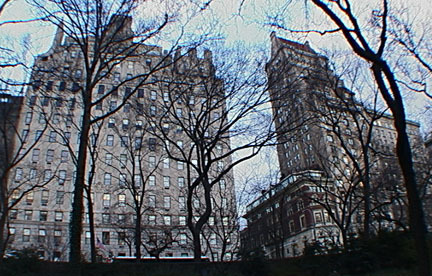 The building has many duplex apartments with grand living spaces facing Central Park and one tenant once had a chinchilla rug in the den. One of the world's most desirable and expensive addresses, the 24-unit building has a concierge, a doorman, an elevator person, an attractive, canopied entrance, and sidewalk landscaping. Although it is a large building, it only has about two apartments per floor. it brings admiration rather than irritation. You know that this is strong enough so that the whole image of elegance would not fall apart if the doorman forgot to wear white gloves one day." 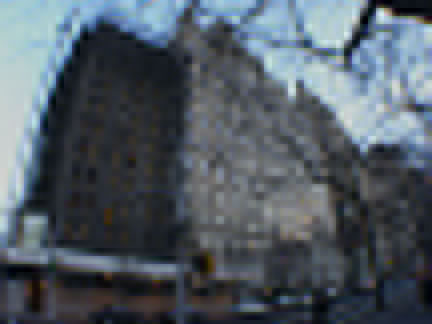 A December 30, 2007 article by Christopher Gray in The New York Times noted that the building's "only hint of extravagance is on the 64th Street side, where a double-height opening on the 11th and 12th floors lights the stair hall of the duplex there." 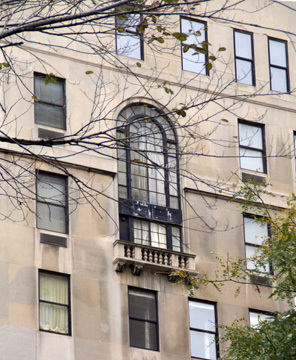 The article also contained details about the apartment bought by Mr. Murdoch, noting that in September, 1929, Hugh B. Baker, a banker and stockbroker, bought the building's top three floors," adding that "A sweeping stairway connected all three levels." "The 15th floor was for entertaining, with a 21-by-33-foot living room on the north side and a 19-by-27-foot dining room on the south. The living room had a small conservatory designed by Howard & Frenaye, and the plans for the dining room indicate a niche, perhaps for a fountain or large piece of sculpture. The 16th floor, on the roof, was drawn with a high square observatory, perhaps 20 feet on a side, flanked by terraces north and south, each one double the size of the room itself," the article continued.